Yes, lets wait until tomorrow to see who we’re talking to…tonight…idiot. Now, republicans have a new favorite nutjob (besting Mitt Romney by a staggering 27% to 23%): Godfather’s Pizza-magnate former Herman Cain. Don’t know the name? Maybe because he’s never held political office. Oh, where do we begin with this guy? 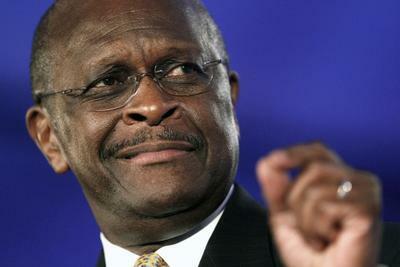 Energy policy: Herman Cain’s common-sense solution to the problem of illegal immigration? A twenty-foot high electrified border fence, with U.S. troops patrolling it. How about land mines? Maybe a moat with alligators? Heh …just kidding, he would never have said that…oh, right. Video Game policy: By now, you’ve probably heard of Mr. Cain’s “9-9-9” tax plan. wherein, to summarize, the poor pay more taxes and the rich pay less. What you may not have heard, is that this “radical new idea” came from the default setting in the video game “SimCity 4”. Hey, have you heard about Cain’s new zombie-killing policy? Recycling Policy: Although, in his own words, Cain has “no idea” how his 9-9-9 policy would actually work, what he does know is that taxes will go up on most goods…but not used goods. Therefore…(ready? )…poor people, struggling with rising food costs, should strongly consider “used goods”. Like…used food…for example. Just as good. Thank you republicans…keep ’em coming. They make me laugh…but also cry a bit. If only one of these weirdos didn’t have a real chance of winning next year. “The other guy is crazy” election strategy may not be enough. UPDATE: Did you know that “a liberal court” killed Jesus? Well, Herman Cain sure does. Man, those uppity liberals, right? « The Gloves Come Off…FINALLY! All I can say is thank goodness the Dominionist Rick Perry and Michell Buckman are out of the race. A USA Christian Theocracy is not what the world needs now.